Atlanta is proud of its Southern culture and we're just as proud of our international culture. The Michael C. Carlos Museum, at Emory University, is a fine example of Atlanta's taste for and desire to be a member of the global arts community. Its collection of Egyptian, Greek and Roman, African, Asian, and Ancient Americas art is among the most impressive in the city. 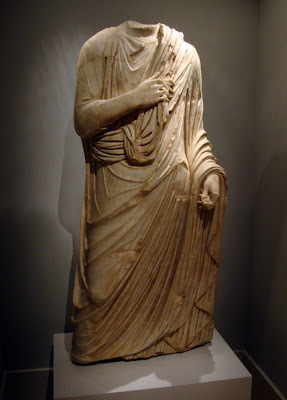 This statue, part of the Museum's Greek and Roman collection, is titled "Togatus" and is believed to have been rendered for a magistrate or other high ranking official in 2nd Century Rome. Unlike much of the other statuary in the Museum, Togatus is larger than life-size, a clue of the subject's social status. I'm discovering that Atlanta universities are an excellent destination for tourists (and locals!) who want to explore the arts, whether of a performance, painting, sculpture, music, or literary discipline. So, when making your touring itinerary, remember that many universities in Atlanta have museums or performing arts programs that are open to the public.